Luxury four star spa hotel, Careys Manor, invites cycle enthusiasts to the New Forest to take advantage of its special offer Cycling Break and the forest’s new and improved cycle routes. The waymarkers have all been replaced in the past few months, with improved numbering and positioning to make cyclists journeys easier! Careys Manor’s Cycling Break combines the best of a relaxation escape with the excitement of an activity break. An expansive playground for cycle enthusiasts visiting from far and wide and widely adored for its miles of beautiful countryside. The break gives all guests access to the Hotel leisure facilities,luxury overnight accommodation and a New Forest breakfast in the Manor Restaurant as well as organising cycle hire with the local hire centre and a personalised picnic for each guest. The luxury Cycle Break at Careys Manor is priced from just £89 per person, (based on two people sharing), giving the guests a saving of £60. It appeals to all levels of cyclists, with over 100 miles of cycle routes throughout the New Forest, guests can enjoy an assortment of rides, from challenging high performance training to gentle leisurely rides exploring nearby villages. This is all made easier and safer with the brand new maps and markers. The Forestry Commission has worked to improve the cycle routes throughout the forest and have recently taken action to replace all of the way-markers (wooden marker posts on the ground) and maps. This makes the routes safer than ever and easier to follow. Cycling in the New Forest is now more accessible than ever, and to more visitors. Communications Manager Libby Burke said: “The waymarkers have all been replaced in the past few months, with improved numbering and positioning to make cyclists journeys easier!" A new cycle map has also been published by the Forestry Commission to coincide with the marker changes and is available free of charge to all, from information centres, forest rangers and partners. The new posts have also been updated and feature QR codes for those with smartphones, which links to the forestry website and cycling pages. For a PDF version of the cycling map click here. Careys Manor hopes too, that the Cycle Break will encourage guests to ‘go green’ and leave their cars at home, with the train station just a 5 minute walk away. Careys Manor Hotel is home to SenSpa, the ‘best spa in the south’. All guests at the Hotel are able to book treatments from an extensive list of more than 40 spa treatments, including massages, facials and body scrubs, as well as upgrades to use the award winning spa facilities. This includes a large Hydrotherapy Complex, Relaxation room and Thai Temple Studio which guests can upgrade to from £20 per person. With three fine dining venues at the Hotel, guests are able to recharge their batteries in style. Diners at Careys Manor can choose to dine at the 2 AA Rosette Manor Restaurant, eat authentic Thai dishes in the AA Rosette Zen Garden Restaurant or French cuisine in Le Blaireau, Bar & Bistro. Head Concierge Colin Parkes said: “I feel reassured by the efforts that have been made by the forestry commission updating the way-markers and cycle maps, cycling in the New Forest has grown massively in popularity and I always want to be sure that when I encourage our guests to go out and explore the forest that they will be able to find their way safely and enjoy everything it has to offer”. 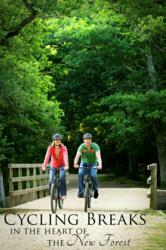 Discover Careys Manor Hotel’s Cycling Break offer in 2013, explore more than 100 miles of cycle routes and be confident in the brand new markers put in place for everyone to enjoy more of the New Forest. For information on the breaks and offers available at Careys Manor please visit http://www.careysmanor.com/luxury_short_breaks.html or contact the reservations team on 01590 624467.